The Project Center contains the instructions, documents, and applications you’ll need to gain approval for PACE Financing through PACE Wisconsin. Review the process below and submit a Pre-Application today to determine if your property is eligible for financing! To obtain PACE Financing, a property owner must complete the application process, which includes a Pre-Application and Final Application. The Program Administrator must approve the Final Application prior to closing a PACE Financing. The first step in securing PACE financing is to complete the Pre-Application, which verifies program eligibility (before applicants invest in project development). New applicants to PACE Wisconsin will be prompted to create a username and password, which will be used to access the Project Center. The Project Center houses program materials and is where subsequent steps in the application process will take place. PACE Wisconsin will notify applicants of their status within two business days of receipt of a completed Pre-Application. Applicants with eligible PACE projects will gain access to all PACE Wisconsin program materials, including the Program Manual and application forms. Following approval of the Pre-Application, property owners should develop their project(s). 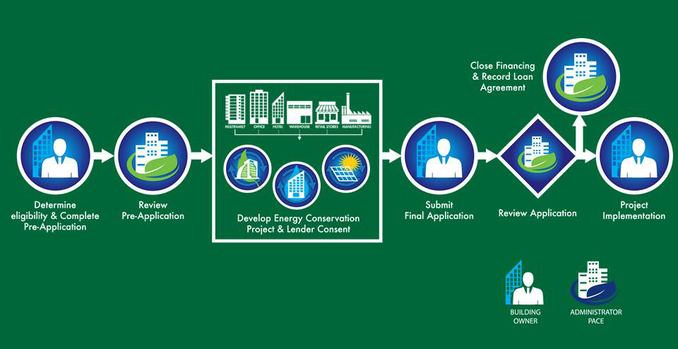 Complete an Energy Assessment, as defined in the Program Manual. Work with installation contractors to determine the PACE Project scope, cost, and schedule. Obtain consent from any existing mortgage holder(s). Contact eligible PACE Lenders to secure PACE Financing. NOTE: If the Applicant has a preferred lender who is not yet eligible for PACE Wisconsin, request that the lender submit a Request for Qualification to PACE Wisconsin. The Final Application is available to the Applicant upon approval of the Pre-Application, and is accessible through the Project Center (under "Existing Application"). Along with a complete Final Application form, Applicants are required to submit documentation about the PACE Project(s). PACE Wisconsin will review the Final Application and provide the Applicant with written Notice of Approval or request for more information within 10 business days of a Final Application submission. Upon the Program Administrator’s approval of the Final Application, a Notice of PACE Wisconsin Approval will be sent to the Applicant and his or her designated agent. Upon receipt of the Notice of PACE Wisconsin Approval, the Applicant may proceed with closing the PACE Financing. In addition to any financing agreements required by the PACE Lender, the Borrower, PACE Commission, and PACE Lender are required to execute the PACE Financing and Special Charge Agreement in conjunction with closing the PACE Financing. Following close of the PACE Financing and Special Charge Agreement, PACE Project work can begin. The property owner or Contractor will draw funds for the PACE Project directly from the PACE Lender according to the terms agreed to between those parties. PACE Wisconsin utilizes a "direct billing and payment" system, which requires the PACE Borrower to make annual installment payments directly to the PACE Administrator (or its servicer). The PACE Administrator will be responsible for directing payments to the applicable PACE Lender. ​​Get started today! Complete the Pre-Application to determine eligibility.